The 12-Volt portable air compressor is compact and powerful. It fits neatly and easily into most standard underbody tool boxes, and it is perfect for roadside service calls and tire changes. Features include a 3 gallon capacity tank and a 1 horsepower motor. This tough, quick motor has a 100% duty-cycle to provide 0 to 120 psi in just 90 seconds. The unit comes standard with a detachable handle and vibration dampening feet. 1 year limited manufacturer's warranty. 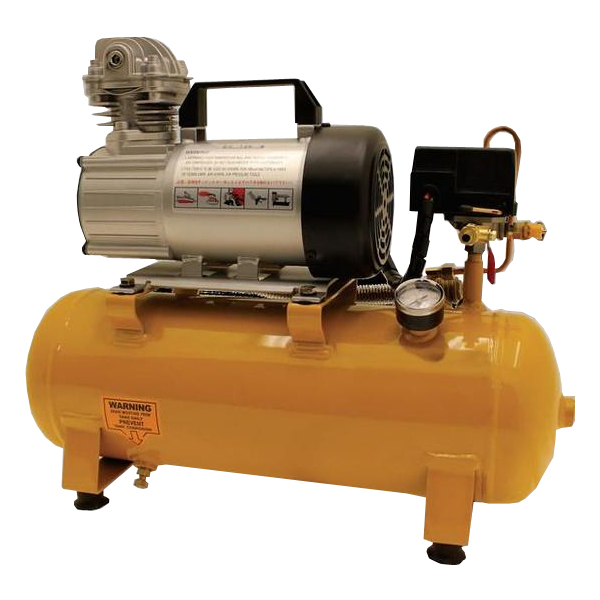 This Air Compressor and 25' hose kit is a must for roadside service calls and tire changes. The 12-Volt portable air compressor is compact and powerful. Its 3 gallon capacity tank and 1 horsepower motor fit neatly and easily into most standard underbody tool boxes. The tough, quick motor has a 100% duty-cycle to provide 0 to 120 psi in just 90 seconds. The industrial self-retracting hose unit features 25' of 3/8" diameter hose and a heavy-duty spring driven drum that rewinds when you are done working. Use the locking ratchet to maintain the desired length during use. Includes stopper to prevent over-retraction and heavy duty body design to stand up to constant use.